Black Pudding Potato Cakes. A wonderful, quick and easy recipe by Albert Bartlett, you can visit their website for more great recipes. 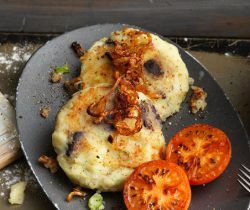 Savoury and moreish potato cakes in 3 easy steps – perfect for breakfast, brunch or supper. 1. Boil the potatoes for approximately 15 minutes until soft. Drain and add the butter and milk and mash until creamy. Season to taste. Add the spring onions and gently fold in the black pudding. 2. Shape into 4 patties and dust on both sides with the flour. 3. Heat the oil in a non-stick frying pan and cook the potato cakes over a medium heat for approximately 5 minutes on each side until golden. Take care not to turn the potato cakes to often as they make break up. 4. Serve with crispy fried onion and scrambled egg.